There has been much discussion about the relationship between climate change, biodiversity and gender equality, and how environmental issues are tied to women’s rights. The UN even has a fact sheet on the theme of Women, Gender Equality and Climate Change, but there are other, more essential aspects at the core of this issue. We will explore these issues in brief. In general, women are more vulnerable than men to problems associated with climate change and the environment. For one, men tend to migrate more easily to places where there are more job opportunities, having more flexibility in terms of work and lifestyle. Women, on the other hand, are traditionally more tied to one place; fulfilling established gender roles, such as caring for their families, working on small, private agricultural plots and engaging in other kinds of unpaid and uncommodified labor. With that in mind, of the 26 million people displaced by climate change since 2010, a whopping 80 percent are women. Women also make up the majority of the agricultural workforce of developing nations, according statistics from the United Nations FAO. They are therefore more vulnerable in terms of job security when environmental factors like drought, fire or flooding affect that sector. Combined with the aforementioned geographical and societal factors affecting women, we can see how environmental stressors and social realities combine and tend to weigh more heavily on female shoulders than those of their male counterparts. By the same token, it is indigenous peoples that make up the most vulnerable communities when it comes to the ravages of climate change and environmental degradation. It is often the indigenous populations of a given country that inhabit the lands that have not yet been — or are in the process of being — altered for industrial and commercial purposes. Because of this, it is these populations that regularly find themselves at the forefront of environmental activism, through not necessarily — or at least primarily — due to ideological reasons. Indigenous activists tend to be fighting for more immediate reasons: their land, their traditions, their way of life and even their survival. Because of indigenous lifestyles and land rights, large corporations and governments frequently target these communities. 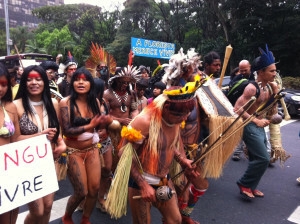 The traditional ways of indigenous peoples are often at odds with industrialization and the rampant exploitation of natural resources. Their very existence can be a nuisance for the worst environmental criminals. Unfortunately, indigenous groups are among the most oppressed and lack significant political or economic power. Corruption and political disenfranchisement of native peoples routinely facilitates the illegal or unfair seizure and development of indigenous lands. Yet it is the grassroots actions of indigenous groups, working in cooperation with other ecological and civil rights activists, which are at the forefront of environmental protection and justice. 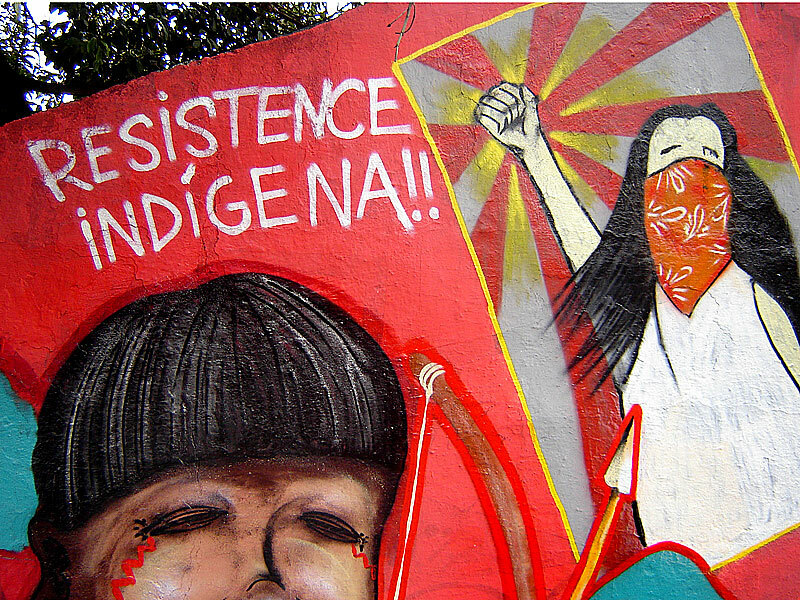 Despite a global imbalance of political and economic power in favor of non-indigenous men, indigenous women make up a visible contingent of activists within environmental and human rights movements. At the 2015 COP21 UN climate talks in Paris, 20 indigenous women leaders from around the world gathered and held their own alternative meeting, where they discussed how to unite and make people aware of their concerns. Also at the Paris talks was Kichwa activist Nina Gualinga from the Sarayaku region of Ecuador’s Amazon. Along with other members of her people, Gualinga traversed the Seine in a canoe built in Sarayaku in order to draw attention to the plight of the Ecuadorian Amazon. 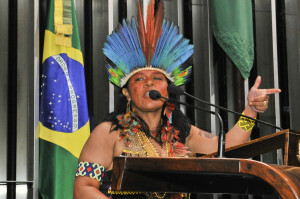 Groups such as the National Organization of Indigenous Andean and Amazonian Women (ONAMIAP — website in Spanish), the Women’s Earth & Climate Action Network International (WECAN) the Women’s Environment and Development Organization (WEDO) and Amazon Watch understand that the concerns of indigenous women are central to understanding the dysfunctional relationship between humanity and the environment. According to a report by the NGO Global Witness, Latin America is the world’s most dangerous region for environmental activists. Between 2002 and 2014 the largest amount of environmental murders for any country in the world, 454, took place in Brazil. On a per capita basis, Brazil was only second to Honduras. The top five worst countries to be a “land and environmental defender” in Latin America — Honduras, Brazil, Colombia, Peru and Mexico — all have significant indigenous populations as well as industries that are dead set on transforming the lands where these people live. The industries involved are typically agribusinesses and forestry, mining and hydroelectric companies. Between 2013 and 2014 murders of indigenous Brazilians increased by 42 percent. Most of these killings are linked to agribusiness. However, hydroelectric projects like the Belo Monte dam, which has the support of the Brazilian government, may end up displacing as many as 20,000 individuals. Touted as cheap and clean energy solutions, dams constructed in indigenous areas of the Amazon require intentional flooding and deforestation as well an influx of tens of thousands of workers. With this sharp increase in population comes secondary industries, pollution and a modern consumer-based culture that is damaging to one of the most biodiverse and culturally isolated places on the planet. Yet even in such a dangerous situation indigenous activism in Brazil has had positive results. 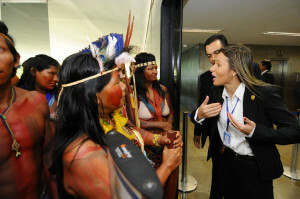 Brazil’s proposed constitutional amendment PEC 215 — which would have opened indigenous territories to exploitation and industrial development at the hands of agricultural, mining and energy industries — was defeated by the efforts of indigenous Brazilian groups in December of 2014. Considering the stated attitude of Brazil’s Minister of Agriculture Katia Abreu — aka “Miss Deforestation”, who referred to Indigenous issues as “obstacles” to progress, this was no small victory. Photos in this article show female indigenous activists passionately addressing the Brazilian Federal Senate regarding PEC 215 and attempting to enter the senate building as well as marching in defense of their Amazonian homeland.